Smartphones drain more battery than feature phones, largely due to the type of operations they perform. A smartphone keeps you connected to the internet, lets you to remotely browser the web, check mails, maintain your social connection, pinpoints your current location, navigates you towards your destination and much more. All this requires huge amounts of power to keep running. Hence, most fully-charged smartphone batteries drain out within 24 hours of use. In this article, we will see how to improve battery performance and lifespan of a Smartphone. Battery performance defines how long your smartphone can operate without charging. This depends on a number of factors mostly related to your battery’s hardware (battery type, power rating, etc.). Most smartphone batteries nowadays are made of Li-ion and have a decent power rating (usually above 1000mAh). But a full charge/discharge hardly lasts more than 48 hours. Though you cannot alter the physical properties of a battery, you can certainly extend a few hours of battery usage per recharge cycle by utilizing power resources optimally. Here are a few ways by which you can increase your Smartphone’s battery usage. Turn the brightness down: Generally, it is the smartphones display that consumes maximum power. You can save some useful power by setting low screen brightness and preferably turn off the display when not in use. You can also use the auto brightness feature if your smartphone is equipped with an ambient light sensor. Auto brightness adjusts the screen brightness automatically according to the surrounding light. Turn off Wireless Connections: Bluetooth, Wi-Fi and 3G/4G are also major consumers of battery power when turned on. 3G/4G networks especially consume greater power among the three. Remember to turn off Bluetooth connections when not in use. Also, use either Wi-Fi or Cellular data (3G/4G) at a time for Internet connectivity. We recommend turning off Wireless Connections when you are not using them. Limit use of geo-services like Maps and Navigation: GPS services continue to update your current location as long as they are running. Turn them off when you do not need them (For example, when you are at home or work). Disable Account Sync and Push Notifications: Push notifications are a new way to keep yourself updated with all the important stuff around you. When someone sends you an email, it reaches your mailbox waiting to be opened. Rather than letting the user “pull” out the mailbox, this feature “push”es an email notification into the user’s smartphone. As you may have observed, the feature requires your smartphone to constantly sync data with service providers which consumes quite a bit of power. Therefore, turn off Sync features when you don’t need them. It will improve your battery usage to some extent. Close all unused apps and free up more RAM: More RAM usage consumes more power than idle RAM. Free up memory by closing unused apps on your smartphone. Use an app like Advanced Task Killer for Android. For iPhone, follow the steps given below. -> Access all currently open apps by double tapping the Home Key. The bottom part of the screen would now display all the open apps. -> Now press and hold an icon from the list until a cross mark appears at its corner. ->Finally, tap the cross mark to close the particular app. Avoid the Flashlights: Avoid using apps that make use of your display or the camera flash for emitting bright lights. These apps drain a lot of battery. Avoid CPU and Memory intensive operations on low battery: Operations such as playing HD games or high resolution videos require a lot of CPU power and drain the battery faster. It is advisable not to perform such operations when battery is low, or else your battery might drain out. Li-ion batteries powering your smartphones have limited lifespan after which they lose their capacity to retain charge. Typically, Li-ion batteries on your phone can last up to 5-6 years. But most batteries die within 2-3 years due to improper charging cycles. However, proper charging/discharging habits can help extend your battery life. Here are some tips to increase the lifespan of the battery. Do not discharge batteries fully: A common myth that exists is that electrons inside your batteries become more mobile and hold more charge when you fully drain out and then give it full charge. However, Li-ion batteries have very limited charging cycles and fully discharging the batteries will in fact shorten its lifespan. Note: Earlier, rechargeable batteries were made of Nickel-Cadmium cells which used to work best when fully discharged and re-charged again. Li-ion batteries work on a different principle and should never be discharged fully. Ideally, a Li-ion battery should retain 40%-60% charge most of the time. Slow charge: Use the USB charging port rather than the wall charger to juice up your phone from time to time. Slow charging under limited voltage helps the battery to gradually gain power and retain the charge for a longer duration. Maintain room temperature: Li-ion batteries are also affected by surrounding temperature. If the phone gets heated up or be left in a cold environment, battery lifespan will seriously be hampered. Keep your phone at normal room temperature to avoid such damages. Avoid keeping your phones in enclosed areas which trap the outside heat. And yes, there is indeed an app for that too. Using advanced monitoring techniques, this app, available for iOS and Android gets you detailed statistics about the status of your battery. Find out how much charge is left on your smartphone and what operations (along with their durations) can you individually perform with the remaining battery. 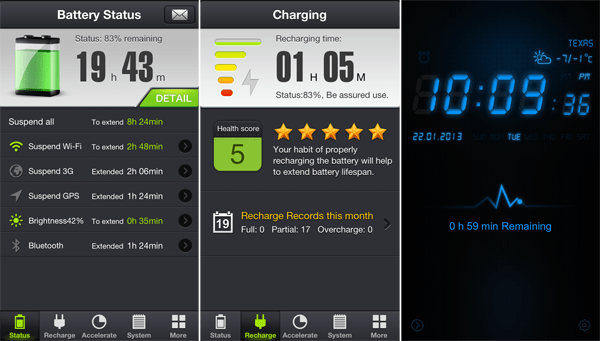 The app can also show you how much battery you can save by turning off features like Wi-Fi, Bluetooth, GPS, etc. It can also give you several details about battery charging and notifies you when it is time to stop charging your phone. Battery Doctor is a useful app that helps to maintain your smartphone’s battery in the correct way and extend its lifespan. Download Battery Doctor for iOS and Android.